Please don't do anything crazy like this, like spinning one on a live alligator! With fidget spinners being the latest craze nowadays, it looks like people are trying to take it to the next level. This guy calmly places a fidget spinner on the alligator's (who goes by the name of Barney) snout and starts to spin it. 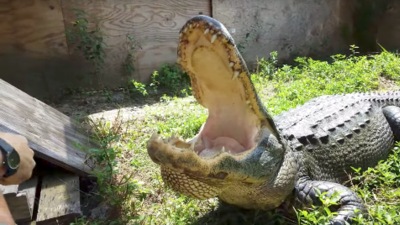 At the end, the gator is very well rewarded and snaps his jaw shut. And then this Floridian placed a fidget spinner on a 14 foot long gator's snout, who is named appropriately "Bone Crusher." We're glad to see this guy live another day or not lose a limb. This seems like it's becoming a trend or we're guessing the next ridiculous challenge. Ok, we'll say it, we don't condone this at all! So don't you dare try it.